NEW! 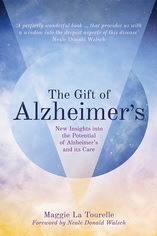 This trailblazing book, The Gift of Alzheimer’s brings insight and understanding to Alzheimer’s and sheds new light on this devastating disease. Maggie La Tourelle, a psychotherapist and healer, documents her evolving relationship with her mother who has Alzheimer’s, interprets what she is saying and gives a moving account of their journey together. It is a multidimensional story that demonstrates the healing power of love and how, by being open and seeking meaning, we can find wisdom in the midst of confusion, and freedom from suffering, and bliss, in other world dimensions. This book will change how you perceive Alzheimers and dementia; what you do, and how you do it, enabling wonderful new heart and soul connections. Your Gift. BBC Woman’s Hour – Guest on the show. Discussion about dementia with Jane Garvey. Maggie La Tourelle is an author, holistic therapist and teacher, based in London, UK, see About the Author.